It was a mild day, perhaps mid-50s. I took a long lunch to go down to the bird sanctuary at Montrose beach. Many, many Canada Geese coming in to land in the harbor. The harbor and lake were hosting large numbers of Red-breasted Mergansers. On the way in, a birder pulled over to inform me that a Western Grebe was hanging around the end of the pier. I headed straight for that since there was little going on in the field and trees. There I saw two birders. 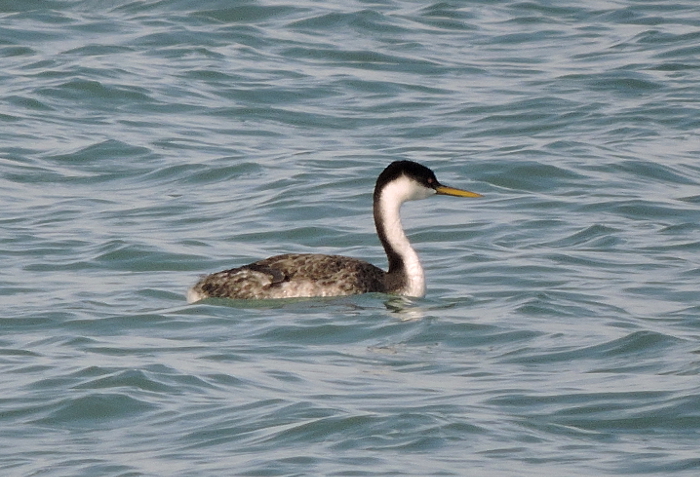 I spoke a little with one who told me that, if you were “lucky, very lucky,” you may see one Western Grebe per year in Chicago. 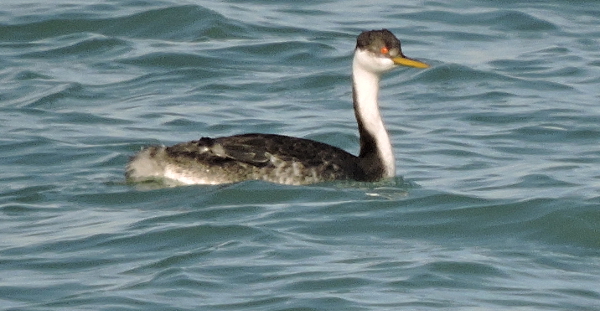 Western Grebe beyond the pier out in Lake Michigan at Montrose.